Discovered in 1817 by J.A. Arfvedson in Stockholm, Sweden, and isolated by W.T. Brande in 1821. 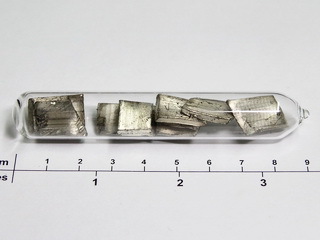 Lithium is a soft, silver metal, and is the first member of the alkali group of metals. 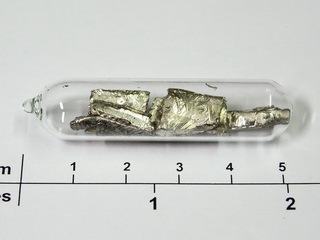 It is the lightest of all metals and, whilst resembling sodium chemically, it is less active. 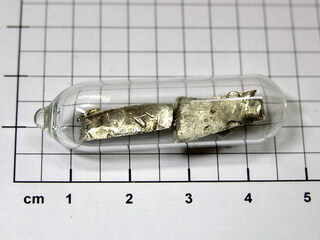 As is the case for other alkali group elements, it is obtained by the electrolysis of the fused halides. The abundance of lithium in the earth's crust is 20 ppm. Lithium reacts slowly in water and in air where it eventually forms a black coating of oxide. This means that this metal tends to be stored under oil to prevent deterioration. Lithium is used as an alloying agent with aluminum and magnesium, and in the manufacture of batteries. Compounds of lithium are used in various applications; for example, lithium 12-hydroxy stearate is used in high performance greases as it provides good water resistance and good low temperature performance; lithium hydride is a strong reducing agent and is used as a source of hydrogen, and lithium carbonate is used as a tranquiliser and in the treatment of some mental illnesses. 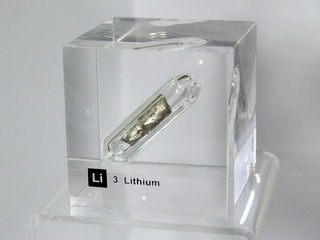 Lithium and its compounds also find applications in the manufacture of glass and ceramics.